I start to use lots of products when it gets cold that I dont really think about when its not - Like bath bombs from Lush, I used their shower gels all summer but wait until it gets cold before I start having a long relaxing soak. Its the same with this next product - I wouldn't think of drinking hot chocolate though the summer but as soon as it get cold its all I want! I was sent this lovely luxury hamper of products from Whittard a few weeks ago! I received three different hot chocolate powders, one plain, one orange and one chili (Excited to try that one!) 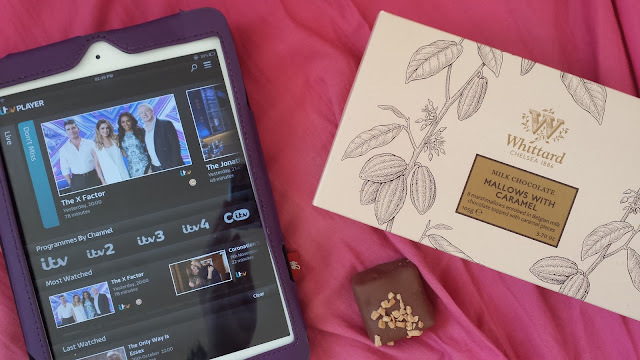 plus a huge tub of marshmallows (which as well as on my hot chocolate I have been munching though in from of the TV oops) plus two boxes of yummy treats to eat with my drinks - Dark Chocolate Salted Caramels and Milk Chocolate Caramel Coated Marshmallows which were amazing. As well as all tasting great, what I really loved about them was the packaging of each product, it is very muted and classic looking! This makes them perfect as christmas gifts! Al I needed really was a can of whipped cream which I will be going out to get next week mmm. Since I didnt have any I just topped it off with the amazing little sugar coated, pastel marshmallows, which are the perfect size for hot chocolate, they all just melted into a layer of marshmallowy goodness and once I'd eaten that, I put more on and started again haha. 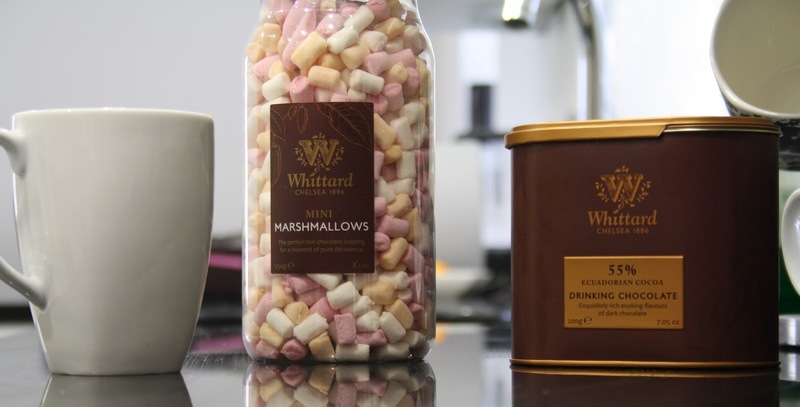 If your a hot chocolate lover then Whittard is the place for with so many different flavored hot chocolates, next on my list is the caramel and white hot chocolates.